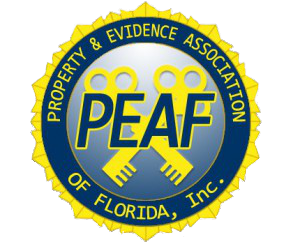 The 2018 Property and Evidence Association of Florida Educational Conference was a (4) day event held at the Wyndham Orlando Resort located at 8001 International Drive, Orlando FL 32819. Our Educational Conference is attended by the Evidence Custodians, Property Officers, Crime Scene and Lab Technicians, Supervisors, Managers, and Directors from the State of Florida that handle, dispose, transport, collect, convert, store, test, and destroy property and evidence within the State of Florida. We are from Police Departments, Sheriff’s Offices, Clerk of the Court, Florida Wildlife Commission, Florida Highway Patrol, Florida Department of Law Enforcement, State Universities, Labs, and the Airports. The 2016 Conference was the most attended Conference to date! Please contact our Conference Coordinator Beverly Hunt at conference@peaf.us for full information. P.E.A.F. is proud to present their 2018 Vendors! Thank you for your support of the P.E.A.F. organization. Our sponsors are in order by our Gold, Ruby, Crystal, and then in numeric and alphabetical order. Please click on the company’s name to be taken directly to their website.